When diseases occur in urban landscapes, it is often presumed that fungicides are the most important and effective disease management tools available. However, a good sanitation program can help reduce the need for chemical controls and can improve the effectiveness of other practices for managing disease. This often-overlooked disease management tool reduces pathogen numbers and eliminates infective propagules (inoculum such as fungal spores (figure 1c) , bacterial cells; virus particles; and nematode eggs) that cause disease. Certain foliar fungal and bacterial leaf spots can become prevalent during rainy or humid growing seasons. When disease management is neglected, pathogen populations build-up and continue to increase as long as there is susceptible plant tissue available for infection and disease development (Figures 1a-c). Infected plant tissue infested soil and pathogen inoculum all serve as sources of pathogens that can later infect healthy plants. Figure 2. 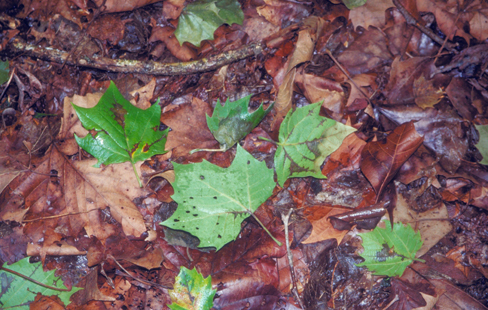 Fallen leaves can serve as a source of inoculum (fungal spores) for additional infections. Many pathogens overwinter in fallen debris and then produce infective spores the following spring. Reduction of pathogens by various sanitation practices can reduce both active and dormant pathogens. While actively growing plants can provide host tissue for pathogen multiplication, dead plant material (foliage, stems, roots) can harbor overwintering propagules for months or years (Figure 2). These propagules can travel via air/wind currents, stick to shoes or tools, or move with contaminated soil or water droplets. Thus, prevention of spread of pathogens to healthy plants and the elimination of any disease-causing organisms from one season to another are the foundations for a disease management program using sanitation practices. 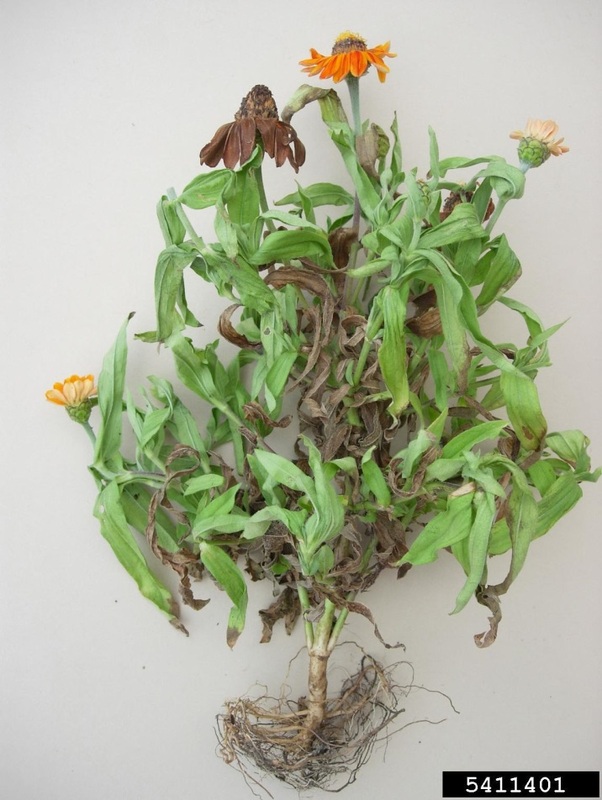 Remove diseased plant tissues from infected plants. 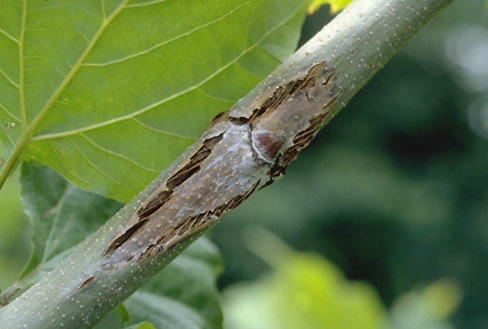 Prune branches with cankers (Figure 3a) well below the point of infection (Figure 3b). Cuts should be made at an intersecting branch. Rake and remove fallen buds, flowers, twigs, leaves, and needles. Disinfest tools used to prune galls and cankers. Cutting blades should be dipped into a commercial sanitizer, 10% Lysol disinfectant, 10% bleach, or rubbing alcohol between each cut. If using bleach, rinse and oil tools after completing work, to prevent corrosion. Discard perennial and annual plants that are heavily infected and those with untreatable diseases (e.g. 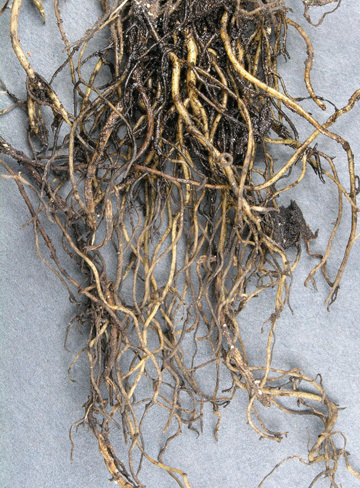 root rots, Figure 4; and vascular wilts). Dig up infected plants to include as much of the root system as possible, along with infested soil. Figure 4. Heavily infected plants or those with untreatable diseases, such as black root rot (images left and right), should be removed from the landscape. Trees and shrubs infected with systemic diseases (e.g. Dutch elm disease, Verticillium wilt, bacterial leaf scorch) that show considerable dieback should be cut and the stump removed or destroyed (e.g. by grinding). 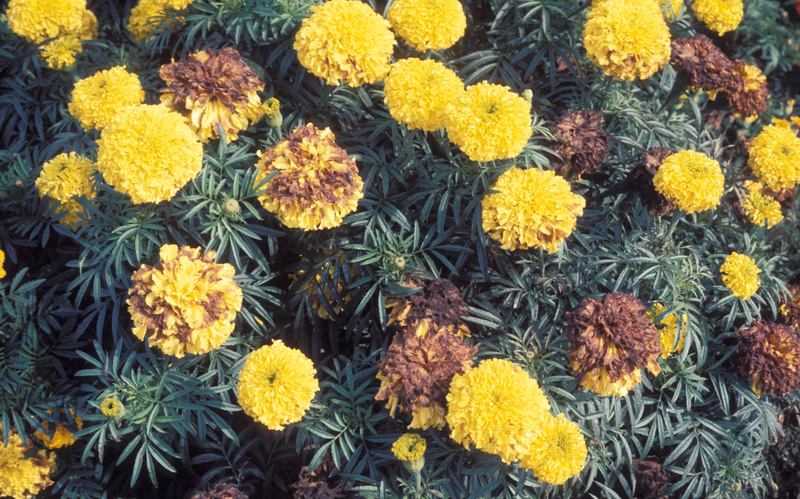 If infected plants are to be treated with fungicides, prune or remove infected tissue (flowers, leaves) and debris to eliminate sources for spore production or propagule multiplication. This should be done before fungicide application. Fungicide effectiveness may be reduced when disease pressure is heavy, which can result when pathogen levels cannot be reduced sufficiently by chemical means (fungicides). Discard fallen leaves, needles (Figure 5), prunings, and culled plants. Never leave diseased plant material in the landscape, as pathogens may continue to multiply by producing spores or other propagules. Infected plant material should be buried, burned, or removed with other yard waste. Figure 5. 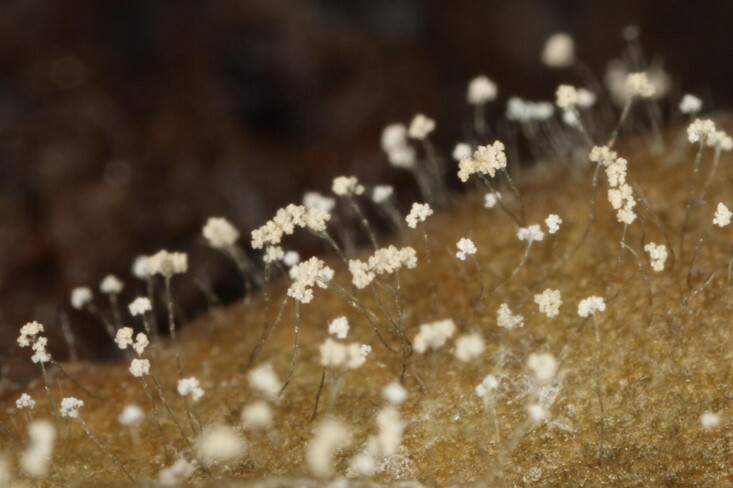 Black fruiting structures of the pine needlecast pathogen contain spores (images left and right). Removal of infected plant tissue helps reduce amounts of inoculum in the landscape. Do not compost diseased plant material or infested soil because incomplete composting (temperatures below 160˚ F) may result in survival of propagules. Homeowners should be cautious about storing diseased limbs and trunks as firewood or using the woodchips as mulch. For example, wood from trees infected with Dutch elm disease should be debarked before placing in a firewood pile. Remove weeds and volunteer plants to prevent establishment of a “green bridge” between plants. A green bridge allows pathogens to infect alternate hosts until a more suitable one becomes available. Be sure to remove aboveground parts AND roots. Soil from container-grown plants should not be reused from one season to the next because pathogens can survive in soil. For gardeners in the eastern U.S., last year was a better than normal gardening season. Better than normal yield, better than normal precipitation, and in our case in Virginia cooler than normal which yielded excellent spring cool season crops as well as early summer crops. But all good things must come to an end; that being the result of several heavy frosts. With that said, I am looking forward to next year’s challenges and what I want to grow for our family. Oh, for the taste of one more summer ripened tomato, but for now, that is a dream and it is time to reflect on what grew well in the garden as well as what didn’t do so well. Hopefully you have kept a garden journal to help you in this task. I find that writing down details of what is planted, the orientation, spacing, fertilization/liming rates and frequency, weekly rainfall amounts, production amounts, etc. is helpful as you start planning for the next season. Like me, you should start thinking about what you want to grow in 2015. Take time to reflect on your 2014 garden production, care, and location. Also, evaluate what went right and what went wrong with the plants and varieties you planted and harvested. This will start you off in the right frame of mind in preparing for the next growing season. Good planning and preparation for next year gives you the tools to have an even better gardening season. A successful vegetable gardener is a happy well fed gardener! I know, you too are already missing those fresh tomatoes, potatoes, peppers, squash, okra, and other great home grown vegetables we treated ourselves to this year, but the next season is ‘just around the corner’ so to speak. After all the days are getting a little longer. Spring can’t be far away! If you just happen to live in an area that hasn’t had frost yet, take your prompt from your plants: when annuals and seasonal vegetables turn brown and begin to die back, it is time to clean up your garden. Your best action is to remove any spent or failing plant materials. Experienced gardeners know that many of the bacteria, fungi, and other disease-causing organisms that caused those diseases. Pathogens that are sources of those diseased plants this past season can survive over the winter in dead leaves, stems, roots, and dropped fruits that get left in the garden. Much like a piece of bread that is kept too long and looks like it has penicillin growing on it, garden debris also will carry the pathogens that can come alive with those same problems when the temperatures begin to rise in the spring. Prevention of diseases and insect infestation now, will keep you from a repeat of problems in next year’s garden. A good leaf rake, given enough ‘elbow grease’, works well in getting the bulk of dead plant material out of your garden. If you experienced early or late blight or other tomato related diseases this past growing season, you want to make sure you reduce, to the best of your ability, the risk of repeating that problem again next year. Yes, there are many new varieties of vegetables available today that are ‘resistant’ to some of these diseases, but ‘resistant’ does not mean they are immune to them. You don’t want to take the chance of returning pathogens, so do a good job, cleaning and ‘sanitizing’ your garden now. Make sure, when removing the plant debris, that you totally destroy that debris so that no pathogens are left behind. Can you compost this dead plant material and use it next spring? Information that you find from Extension offices across the U.S. will recommend that you do not. The reason being is that most people do passive composting i.e. put it in a pile, and then using what compost develops, put the compost back in the garden for the next season. It is best to burn the plant material; this will destroy the pathogens and weed seeds as well and return some carbon back into the ground when you spread it out. Please check local/state laws prior to burning. Many states and/or localities have burn bans especially this time of the year. Another method, if your local law allows it you can bag the material and send it to the landfill. Each year there are more localities that ban yard waste from their landfills. If you are not sure, check with your locality to learn more about your local waste and recycling laws. If you do decide to go with active composting; composting at a temperature 140°F, or higher, will destroy many of the disease organisms as well as many weed seeds. You will need a temperature probe to monitor compost temperatures. It’s really not hard to source a compost thermometer either through the internet or local retail outlets such as garden centers or nursery supply stores. If in doubt about your compost pile reaching these high temperatures, it is best to side with caution and discard the material by properly bagging it or by burning based on your local ordinances. Some of our most notorious insects of the garden such as Mexican bean beetle, squash vine borers, European corn borer, cabbage loopers, can also overwinter in garden debris. Larvae will use debris as a safe harbor. Flea beetles and spider mites, as well, can find food and winter shelter in spent plant material and weeds. After you have finished cleaning up the debris from your garden, it is time to turn over the soil to both aerate and break up any remaining debris into smaller pieces that will be turned under. A good rototiller will help make this job easier. Once buried, any plant material left will decompose more rapidly. If you haven’t done a soil test in three years or more, it is time to retest and determine the needs of your garden soils based on what you will be growing in the next season. Soil test kits and instructions are available from your local Extension Office. Also, in planning next year’s garden, rotation of your crops is a must do item. This simple action will help keep disease issues down. If your soil test(s) recommend liming, you can go ahead and put down lime this time of year, allowing it to start adjusting the pH. If the ground is frozen already, wait until spring. As you add lime, you can also help build soil structure by incorporating compost or shredded leaves. These soil additives will also add beneficial micro-nutrients and beneficial organisms. If you want to further build the soil, you may want to consider putting in a cover crop that will not only hold soil, but when tilled in early spring, will further build a healthier garden soil. A legume such as white or red clover would be something to consider. Check with your local Extension Office for best cover crop recommendations for your area. 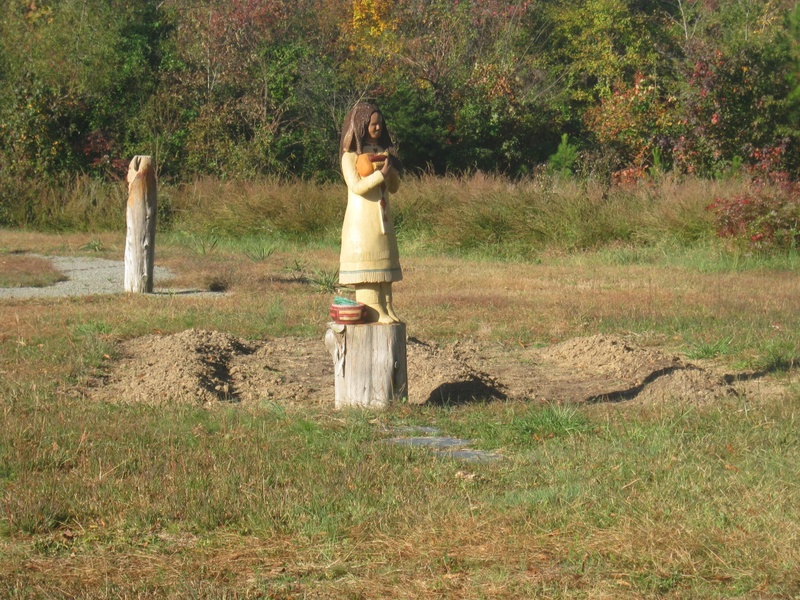 “Three Sister’s Garden-Fall Clean-up “Southern Virginia Botanical Gardens” Photo by W. McCaleb 10/28/14 Corn, Beans, and Squash was grown here as the native Cherokee have done for centuries. Cleaned up and ready for spring 2015! Where did the 10-20-30 rule come from? Is it adequate? We’ve been having an interesting discussion over on the Urban Forestry group on LinkedIn on the origins and suitability of the 10-20-30 rule for tree diversity in urban forests. For those that aren’t familiar, the 10-20-30 rule is a guideline to reduce the risk of catastrophic tree loss due to pests. The rule suggests an urban tree population should include no more than 10% of any one species, 20% of any one genus, or 30% of any family. The other question on the LinkedIn discussion is whether the 10-20-30 rule is adequate to ensure genetic diversity in urban and community forests. My personal is opinion is that the rule is inadequate but far preferable than the status quo in most communities. If we consider the current issue with emerald ash borer (EAB) in North America, following the 10-20-30 rule means we would accept the loss of 1/5th of our urban canopy since both of the commonly planted ash species (Fraxinus pennsylvanica or F. americana) are highly susceptible to EAB. On the other hand, many community tree populations the US currently include 30% or more maples, so 10-20-30 would actually be an improvement. A limitation to the 10-20-30 guideline that Santamour acknowledges is that the rule does not afford protection against insects with a broad host range such as gypsy moth or Asian long-horned beetle. However, while these pests can, and have, caused widespread damage they do not appear to threaten nearly total annihilation of an entire species or genus ala specialists such as chestnut blight, Dutch elm disease or EAB. Moreover, a wide diversity of species is still a better defense even against generalist pests, unless you happen to get lucky and plant a monoculture of the one tree they won’t destroy. One of the inherent challenges in the 10-20-30 rule is implementation. What is the tree population in question? Are we talking about a city? A neighborhood? A block? If there are 10 trees on a block do they all need to be different species? Some have proposed corollaries to 10-20-30 such as the “Look around rule” (or “Look around, fool!” if you prefer the Mr. T version). This guide states if you’re getting ready to plant a tree; look around and if you already see that tree, plant something else. The problem with diversity on a very small scale is we can end up with the ‘menagerie effect’ – one of these, one of that, one of those – that often lacks aesthetic appeal. Ultimately this becomes a challenge for urban foresters and designers working together; how do we incorporate diversity guidelines within established design principles. Posted on January 8, 2013 Author Bert CreggCategories UncategorizedTags biodiversity, diseases, pests, woody1 Comment on Where did the 10-20-30 rule come from? Is it adequate? Every once in awhile I get to work with really, really cool people who do really, really cool work. This is one of those times. About a year ago I received a message from Dr. Stephanie Valberg, a Professor over at the University of Minnesota’s Equine Center. It seems that she was interested in looking at a deadly disease called Seasonal Pasture Myopathy which she thought might have something to do with horses ingesting maple leaves. Specifically, at the time she contacted me, she thought that this disease might be associated with horses ingesting tar spot, a common disease that maples get. Seasonal Pasture Myopathy is a particularly nasty disease because it is fatal in over 90% of cases, and the death is far from painless. After doing site visits to many farms where this disease was found, she discovered something very important: Every farm had box elders in a location where horses could feed on the seed when they got hungry. And for most of the farms, horses were also dealing with scant pickings in terms of food. They usually had sparse pastures and not much supplemental hay. So, in these conditions, the horses might find box elder seed attractive, or at least palatable. After a literature search, Dr. Valberg discovered an old article showing that box elder seeds could very well contain a toxin, hypoglycin A, which might cause this disease if they were eaten. After testing the seeds for the presence of this toxin (Done by a friend of mine, Adrian Hegeman, located here in the University of Minnesota’s Department of Horticultural Science) it was established that, Yep, box elder seeds have this toxin, and if your horse eats them, it might be in trouble. You can find out more here. Right now more work is going on to see if this toxin is more or less present in box elder trees that are under stress, if it is present in other parts of the tree besides the seeds, and at what time of year the toxin might be most present in the seeds. It also looks as though some other maples may have this toxin in their seeds, most notably sycamore maple. All in all, having the opportunity to watch this work unfold has been one of the highlights of my career. It was like watching an episode of House unfold in real life. And the great part is that this work has the potential to save the lives of dozens, if not hundreds or thousands, of animals. So if you have horses, and box elder or sycamore maples in your pasture, be careful! Herbicide issues seem to be dominating my life these days. Over the past several weeks reports have surfaced around the Midwest of landscape conifers – primarily spruces and pines – that have developed rapid and severe die-back. While there are a host of insect pests and pathogens that can cause die-back in conifers, the recent cases are noteworthy in the speed with which trees expressed symptoms. Given that reports of damage showing similar symptoms have come from Kansas, Iowa, Indiana, Michigan, and Ohio it seems unlikely that everyone is mis-applying the product. I suspect one of a couple things may be going on. Dupont may have underestimated the lateral extent of tree roots, especially for conifers that often have shallow, extensive root systems. It’s also possible that Norway spruce and white pine are more sensitive to this product than whatever Dupont tested it on. Soil solarization is regarded as an environmentally friendly alternative to pesticides for controlling nematodes, weeds and disease. Sheets of plastic (generally clear) are spread over the ground and solar energy heats the soil underneath to temperatures as high as 55C (or 131F). Since the soil environment is usually insulated from temperature extremes, the organisms that live there are unlikely to be resistant to heat stress. This is a practice best suited to agricultural production, where monocultures of plants have attracted their specific diseases and pests. Decades of research have shown success in controlling pests in greenhouses, nurseries, and fields. But there’s a down side to this chemical-free means of pest control. It shouldn’t be surprising that beneficial soil organisms, in addition to pests and pathogens, are killed by solarization. Studies have found that soil solarization wipes out native mycorrhizal fungi and nitrogen-fixing bacteria. One expects that other beneficial microbes, predacious insects, and parasitoids living in the soil (but so far unstudied) would be eliminated as well. So this spring, instead of solarizing your soil, consider some less drastic measures of pest and disease control. Minimize soil disruption to preserve populations of desirable microbes. Plant polycultures (more than one species) in your vegetable garden, or at least practice crop rotation. Protect and nourish vegetable gardens with compost. Use coarse organic mulches, which provide habitat for beneficial insects and spiders, in landscaped areas. Above all, try to treat your soil as the living ecosystem it is, rather than a war zone. Sudden Death Syndrome in Soy — Biggest Threat to the Entire Food Chain? This past week we received an interesting e-mail about something called “sudden death syndrome” which we were asked to blog about. Here’s the article we were sent. We don’t always take requests, but we thought that this was an interesting one, so we decided to write a little post about it. Sudden death syndrome is basically a fungal disease which affects the roots of soybeans. Recently there has been some press out there about how Round-up ready soybeans are particularly susceptible to this disease and that the spraying of roundup itself can lead to favorable environments for it. This is a particularly attractive disease for a number of groups because it provides fuel to their fire. The anti-biotech group likes it because it makes Round-up ready crops look bad, the anti-pesticide group likes it because it makes pesticides look bad, the anti-Big Ag group likes it because it makes Monsanto look even more evil than usual. So, in short, lots of happily indignant people. Now there are some studies, mostly in test-tubes and greenhouses, which show that Round-up could make SDS worse, but in the field, where it actually matters, there just aren’t that many studies which show a correlation between using Round-up Ready soybeans and SDS — and more studies that show that there isn’t a correlation. What it all comes down to is that there is a possible relationship between Roundup and SDS, but, despite a lot of research (both government and industry dollars flow easily to agronomic crops), this link isn’t crystal clear and may not exist at all. Posted on February 11, 2011 Author jeffgillman003Categories Cool ResearchTags diseases, herbicides10 Comments on Sudden Death Syndrome in Soy — Biggest Threat to the Entire Food Chain? After Linda’s post yesterday I just had to add my own 2 cents about gator bags. I use ’em and I like ’em. But, that said, I never allow gator bags to sit against trees for an extended period of time (Maybe 6 weeks when the tree first goes in). That’s just asking for trouble! But looking at those bags got me thinking about a project which we’re finishing up this year. Volcano mulching. Believe me, it sounds a lot cooler than it is. Volcano mulching is when you make a big pile of mulch along a tree’s trunk, as in the picture below. The reason we’re looking at volcano mulching is that everyone says it’s bad, but no-one has really proven that it’s bad. The reasons that volcano mulching are supposed to be bad are twofold: First, the mulch could cause rot on the tree’s stem (as with those gator bags) and second, because it might be possible for a tree’s roots to grow up into the mulch, potentially surrounding the stem, which might lead to the roots choking the stem as the tree grows larger. Not a good situation. Anyway, early in 2007 we took a field of maples and cut squares in their trunks, as seen below, and then either did or didn’t mound up mulch around these tree’s stems. What we expected to see was that, over time, the wounding and presence of a mulch volcano would lead to diseases in the stem. Instead what we found is that, for many of the trees, deeper mulch actually led to the wounds closing more rapidly. The image below is of a wound that was covered with mulch. While this next image is of a wound that wasn’t covered with mulch. So what does all this mean? Well, nothing yet. Research is a funny thing: it rarely gives you quick and easy answers. I won’t recommend mulch volcanoes because we still haven’t examined those roots that may enter the mulch and surround the stem. And before I say that the volcanoes didn’t affect stem rot in this study I want to take a closer look at those wounds by cross sectioning the tree which we’ll probably do this fall. Plus we’ve got to run statistics on all the different trees….. and then it would be great if someone else would take a stab at this study to confirm what we see…. I tell you what, nothing’s easy. Long term problems with Tree Gators? So, Bert, you (and others) have done research on Tree Gator-type products and found them useful in providing water to newly planted trees and shrubs. For those of you that haven’t seen supplemental irrigation products, they are heavy-duty plastic bags that zip up to create a sleeve around tree trunks and drip water from their perforated bottoms (Figure 1). The City of Seattle uses them routinely, but I’ve seen a number of trees fail in spite of the additional irrigation. While many of these failures are undoubtedly the result of poor root systems, inadequate root preparation, and/or improper installation (Figure 2), what worries me is the long-term effect of these sleeves on tree trunks. I’ve seen nothing in the scientific or professional literature about this possible problem. So I thought I’d do an informal assessment of Tree-Gatored trees. Given what I’ve found, though, I’m tempted to do a more structured survey. First, I found a number of Tree Gators that were empty – probably close to half were nearly or completely drained. These devices don’t too much good if they aren’t kept filled. That’s an easy problem to fix compared to what I found when I unzipped the bags to look at the tree trunks. When the bags are full, they press against the trunk, creating a humid, dark environment (Figure 3) that’s only made worse when rainwater seeps into the space. As you can see in Figure 4, over time the bark rots, allowing insects and disease into the living tissues. The insects ran when I opened the bags, but I saw numerous pillbugs and millipedes – which feed on decaying matter – in those trees with rotting trunks. I think there can be fatal problems for young trees when these bags are used long-term. IMO, supplemental irrigators that resemble rubber donuts laid over the root zone are better designed. I would be sure to have a mulch layer protecting the soil from compaction by these water-filled rings, but at least the trunks are left uncovered. Posted on August 5, 2009 Author Linda Chalker-ScottCategories What About the TreesTags diseases, pests, products, woody7 Comments on Long term problems with Tree Gators?